Shelby graduated from Nazareth College with her Doctorate in Physical Therapy after receiving her Bachelor in Health Sciences. Through her clinical rotations, Shelby worked in multiple settings including outpatient orthopedics, inpatient traumatic brain injury rehabilitation, and pediatrics. Shelby enjoys working with patients of all ages including pediatric patients ranging from toddlers to adolescents. Shelby believes in treating the patient as a whole and incorporating a patient’s interests into her treatment style. 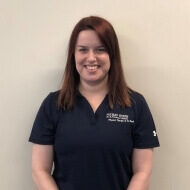 Shelby is passionate about using manual therapy techniques and functional exercise to help patients return to their prior level of function and participate in activities they love. Despite growing up in New York, Shelby has always been a Boston sports fan. When not at work, Shelby enjoys staying healthy and active through hiking, kayaking, and trying new fitness classes.